Q: How many sailors does it take to screw in a lightbulb? A: It's cheaper to sit in the dark. 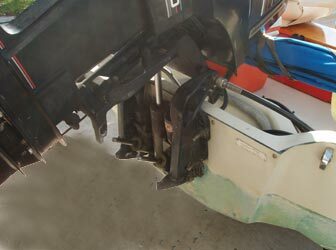 When we first bought our 1989 Boston Whaler 15, there was a slow leak in the hydraulic power tilt and trim system. If you tilted the engine all the way up and left it for a few hours, it would slowly settle back to the fully tilted down position. I had to use the trailer tilt lock arm to keep the engine tilted up. When cruising, the engine would tilt itself down, and every minute or so, I had to tilt it back up. It was very annoying. I would tilt it up a little too high, making the boat start to porpoise, and it would quickly leak down to a good trim range for a few blissful seconds, then it would be too far down, and the bow would plow lower and lower in the water until I tilted it up too high again. The problem is, I'm a sailor. So I'm cheap. My old leaky tilt and trim system was working, and like the sailor who figures it's cheaper to sit in the dark, I was just refusing to buy a new hydraulic tilt and trim system for the engine. I knew the old power tilt and trim system was not worth repairing, and I also knew that the engine was worth about the price of a new power tilt and trim system. I did not want to buy a part that cost as much as the engine was worth, so I sat in the dark, trimming my engine up every few seconds. I finally decided to replace the hydraulic tilt and trim system. It was expensive, but worth it.